With the holidays almost completely upon us here in Maryland, more and more outdoor lighting displays have popped up with each passing day. While there are great displays of Christmas and holiday pageantry across the state, there’s a particular area of Baltimore that shines a little brighter than the rest. We’re speaking, of course, of Hampden Baltimore and The Miracle on 34th Street. For the uninitiated, Aqu-Bright is here with the history of this outdoor lighting extravaganza. The Miracle on 34th Street Put Hampden on the map. A working-class neighborhood that originated as a mill town, Hampden’s outdoor lighting tradition can be traced back to as far as 1947. Starting on the titular 34th street and spreading to other pockets of the neighborhood, this holiday ritual is a sight to behold. Running from late November into early January, this event sees Hampden residents decorate their homes with thousands of ornaments and lights in elaborate and colorful displays. These outdoor lighting exhibitions prominently feature many kinds of Christmas trees, trains, animated figures, Walt Disney cartoon characters, Hanukkah menorahs, artwork, and more. The event has become a major tourist attraction, seeing hundreds of visitors from all over the world. At Aqua-Bright LLC we know that outdoor lighting can mean a whole lot more than just illumination. For people inside and outside Hampden, Baltimore outdoor lighting has become a holiday tradition and a way of expressing the season’s message of peace and joy. At Aqua-Bright, we can help you find the right outdoor lighting for your home. 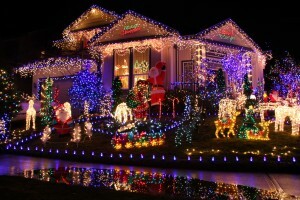 We’ll help you find a solution to make your outdoor Christmas lighting display spectacular and safe. To talk to someone about Outdoor Lighting in Baltimore, Maryland or the surrounding areas, call Aqua-Bright today at 410-489-9009 or take a tour through our website. This entry was posted on Wednesday, December 10th, 2014	at 8:49 pm	. You can follow any responses to this entry through the RSS 2.0	feed. Both comments and pings are currently closed.